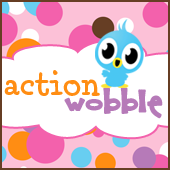 Action Wobbles: What was I thinking? This is Melissa from Moe Creations I have a quick Action Wobble post for you today. I got this image from Krafty Nook and this little guy just looks like he forgot something, hence "What was I thinking?". It would be perfect for a belated birthday card, what do you think?